Today is a good day to walk. I woke to a morning of pure stillness and clear blue sky, warm enough that I had no need for a fire and will soon need no heat at all. Winter is far from over yet my garlic has broken ground and the weeds are emerging as well. Both will survive any further freezes and the rain soaked ground urges them to grow quickly, which they will. New Mexico is fickle at best and in spite of the rains and snow which have blessed the last two months we are still in a perpetual drought and we likely always will be. Still, for the moment, there is plentitude and it triggers every part of nature to respond in full fashion and man and beast will follow suit. So it is with the elk, and the Native people whose lives revolve around the seasons as well. 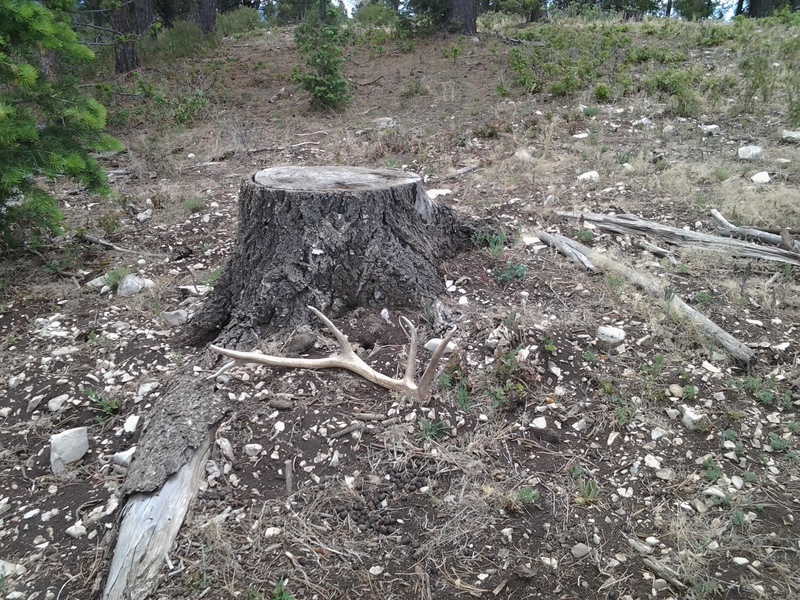 The word is out, someone found a set of freshly shed elk anters and it is time to seek the rest. It is not just the monetary reward, though that in itself is something of value. It is instead the urge to seek out the treasures laying in the soft duff of the forest and the flats. It is the inborn desire to put their feet to the paths the elk have worn deep into the mountainsides and to see who can find the most horns by the end of the day. The pride on the faces of those who find the biggest and the prettiest prize is evident in every aspect of the contest and it drives everyone to make some effort towards the same, myself included even if my needs are simpler. I desire the peacefulness and the adventure as much as I do the forced exercise which will firm my buttocks and thighs, as well as restore my spirit. Today is a day to walk. Most times I would eagerly await a phone call from a friend and gladly set aside all my other projects for the opportunity. Not today though, my hiking partner and I have distanced ourselves and I have important things to do which will keep me from those ventures, even if I regret the same. It is my conundrum to deal with, the one I have the most difficulty with but which ceases to go away. I want both to be in my reach but the very fact I indulged myself so freely in the past year holds me prisoner in this one! If I am to have one I must tend to the other as the greatest difference between my life and that of those who will be walking the mountains today is that my version of necessity far outdistances theirs, even if I am ultimately better off. I may struggle to maintain the balance between necessity and true happiness but the sense of purpose that requires will also save my life while the lack of it gradually destroys theirs. Today is a beautiful day and begs to be enjoyed just as the past few have done the same. It is springtime in winter and the harbinger of the months to come when nature restores her coffers and new life begins again. It is a day to walk, or to turn the soil, clean the yard, air the blankets, anything to get outside and absorb the sunlight into our winter pale skins. Everyone will be drawn out today for one reason or another and I will do the same, even if my day will be busy also, I am grateful that I have plan. My week was filled with the same restless yearning that will drive me forward today. The difference is, with the day being my own, that I will be moving forward towards fulfillment of my goals and I will have the freedom to choose my activities going forward. Now is the time for me to affirm those efforts and they will see me back to those elk trails soon enough and allow that the bounty of that effort, coupled with all the others, will fulfill my every need. Today is a day to walk, and walk I will, along the path of purpose and direction which will see me towards my dreams.